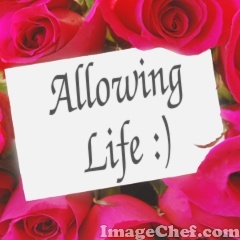 Allowing Life :) – "Nothing is too good or too simple to be true." Posted October 28, 2017 by Olga and has no comments yet. Which motto do I choose for my upcoming week? What did I especially love doing this week? Whom would I want to meet? What would I want to be doing? What would I want to be feeling? Why am I the happiest being in the entire world? Posted October 1, 2017 by Olga and has no comments yet. understanding that everything is a work in progress. Posted August 23, 2017 by Olga and has no comments yet. Posted August 8, 2017 by Olga and has no comments yet. “Do realize, that the greatest obstacle to the discovery of peace, harmony, yes – even the great awakening in your life – indeed it is the last obstacle – is the belief that there is an obstacle. There are no chains. There are no doors. There is no path. There is no process. There is nothing you must find. There is nothing you must learn. There is nothing you must change. There is nothing you must be. Posted May 29, 2017 by Olga and has no comments yet. Posted March 20, 2017 by Olga and has no comments yet. Posted February 6, 2017 by Olga and has no comments yet. Posted February 2, 2017 by Olga and has no comments yet. It was kind of a challenge for me, my coach drew my attention to this: I’m trying not to invalidate what-is, but then I don’t ask myself, how I want it to be, thus not opening this door to how it can be. It’s like, when I was asking myself, what I want it to be, I was feeling like betraying the now, finding fault in it. And I didn’t want this feeling (either of it) to be there. I wanted to “be happy with what is and eager for more”, in somehow harmonious way. Then it feels like improvement, and there is in it ‘thank you’ to what is, and I can enjoy what-is, together with the feeling of this growing alignment and happiness into the future. Of this wonderful unfolding and happy flowing forward, being appreciative in the now. I feel that there is more to it, and this is also a good feeling: that I can go and be with it more, and its beautiful nature will be unfolding to me as I work pleasure with it. Posted November 23, 2016 by Olga and has no comments yet. Interesting, especially comparing it with what Rikka Zimmerman said: that fear is the sensation of leaving a vibrational box. I love it. Posted November 13, 2016 by Olga and has no comments yet. Many things impressed me in this, but especially that immediately after “Perceive” there’s “Choose”: we see something? We immediately discern, if that’s what we prefer, and immediately choose, which vibration we now step into. No going into “why I deserved this”, no doubting, if we deserve better, no “why I attracted this in the first place”, no arguing with the circumstances – just choosing, which vibration we prefer now, based on perceiving this experience and observing our feelings, and stepping into this vibration, now. Sounds similar to what AH said, to immediately discern and “give our undivided attention” to the vibration we prefer. I am choosing it now.